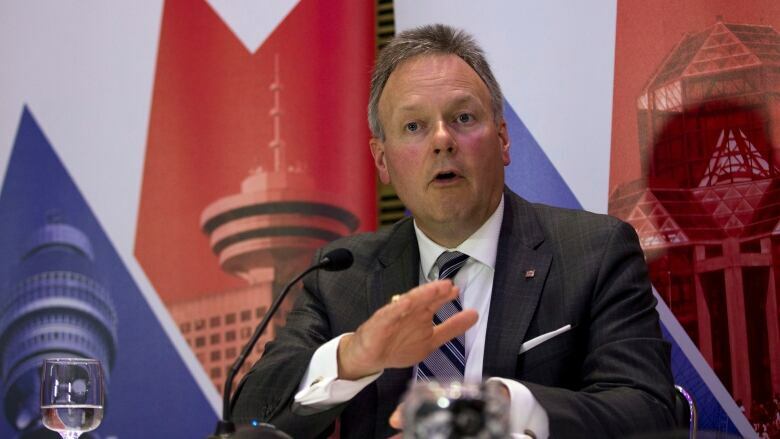 Stephen Poloz is defending his surprise January decision to cut the Bank of Canada's key interest rate, saying there is no need for central banks to signal their moves ahead of time as economies return to normal. In a speech delivered in London to the Canada-United Kingdom Chamber of Commerce, the Bank of Canada governor said the rate hike was needed to deal with the oil-price shock and he believes the strategy has worked. "We knew that financial markets would be surprised by the move in January, and we generally prefer to avoid surprises. But we will do what is necessary to fulfill our inflation-targeting mandate," Poloz said. "Over the following weeks, we saw inflation decline as expected, and output expand in line with our projection." He said the rate cut has given the central bank time to observe what happens in the economy as the effects of low oil prices play out. The negatives are already being felt, but the positive effects of lower energy costs for consumers and businesses may take longer, Poloz said. Poloz responded to critics who have said the Bank of Canada’s credibility has been hurt by not letting markets know it would raise rates. Numerous voices on Bay Street and Wall Street said Poloz had lost credibility by failing to signal the rate cut. He said policymakers at the Bank of Canada "believe that statements to explicitly guide market expectations about the future path of interest rates are best reserved for extraordinary times." “Otherwise, it becomes addictive and loses some of its impact — in short, forward guidance is not a free lunch, it comes with costs,” Poloz said. One of those costs might be that the central bank is constrained in its ability to act when circumstances change, as in the situation with the oil price drop. He acknowledged that knowing how interest rates might change in the near future reduces volatility in markets, but said it encourages market participants to position themselves around interest rate bets, instead of market fundamentals. The current return to volatility on stock and commodity markets is actually a return to normal, Poloz argued. “When shocks to the economy occur, whether positive or negative, higher financial market volatility is a natural consequence, an integral part of the economy’s equilibration process,” he said. He argued the job of the Bank of Canada is to stabilize inflation and economic growth, rather than to attempt to calm markets. TD senior economist Randall Bartlett zeroed in on Poloz's defence of the bank's credibility. "Overall, today's speech was half a summary of the reach on the role of central bank credibility in contributing to long-term bond yields and financial market volatility, and half a defence of the surprise interest rate cut in January and the governor's dislike of forward guidance in setting the path of the overnight rate," he wrote in a note to investors. "While modestly dovish, he doesn't provide much in the way of signals as to future path of interest rates." BMO senior economist Benjamin Reitzes said Poloz had signalled that Canadian GDP growth would be very slow in the first quarter, but gave no signal of further rate cuts. "The bank doesn’t appear to be itching to cut rates further, but another move cannot be ruled out if the economy stays weak into Q2 or oil prices see a renewed sharp slide," Reitzes said.